On December 18, 2014 Microsoft release the preview of PowerBI Dashboards, as long as you live in the US. Since Power BI has an iterative deployment cycle, releases have been rapid and varying in detail. 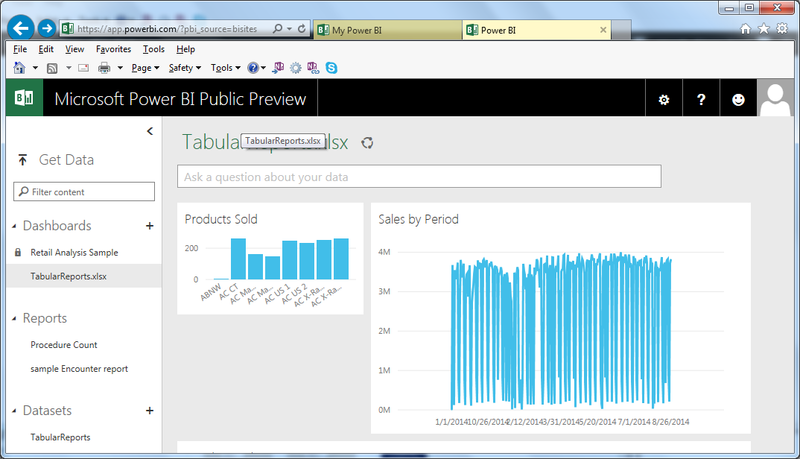 This release is huge as takes a further step from separating Power BI from Excel. With this release, creating data visualizations moves to a new tool, the Power BI Designer. When this preview is fully released so countries outside of the US have the ability to play with it, Excel is no longer necessary. Of course the option to use Excel is still there, but creating visualizations, be they dashboards or not, can be done on the web with Power BI Designer. As anyone who has reviewed the marketing information from Microsoft knows, dashboards are not new in Power BI. The ability to put multiple data representations on one report has been available since the product was first previewed. The difference is Excel is no longer required. Since the Power BI was released, it appeared to be just an expansion of Excel’s feature set. The one power tool which was supposed to be only available to Power BI subscribers, Power Map, was released to existing Office 365 users after the preview version expired. It’s not exactly the same version of PowerMap, as only Power BI users get updates but Excel users can still use the preview version. Power Query, Power Pivot and Power View have been included in Excel’s features for a while, which left many users thinking there was no reason to pay for Power BI, unless you wanted to distribute data visualizations in a Mobile Environment. Being able to design reports completely in the cloud provides a more compelling reason to sign up for Power BI. The new dashboarding feature is still in preview, so I assume that a lot of the access methods for it are going to change, so keep in mind that these instructions may not work in the next release, which could be soon. Here’s what you see when logged into your PowerBI account. The first time you click the try it now link, Microsoft will update your account, which means that you will need to wait until it loads to use it. After they are done, this link will work to load the Power BI Dashboards. Keep in mind since this is a US only preview, the new dashboards are not fully integrated into PowerBI, as the visualizations there don’t show up in your favorites, but it is logical to assume that it is coming. Clicking on the Try It Now button brings up this screen. Designing Dashboards is meant to be simple, so the steps involved to create them are few. First you need to select a dataset, on my screen you will see that I have picked an Excel spreadsheet called TabularReports. Then you select the data that you wish to display, and Microsoft picks a display format, which you can change to any of the standard visualization types, like the bar chart I have here. The reports you wish to see here are pinned. If you don’t pin them they lurk inn the background. Save this and you are done. This first version away from Excel offers a lot of interesting features and definitely moves Microsoft closer to the features offered by their competitors. Dashboard also provides a real reason to use Power BI instead of Excel, a topic I will definitely be exploring more in the future.